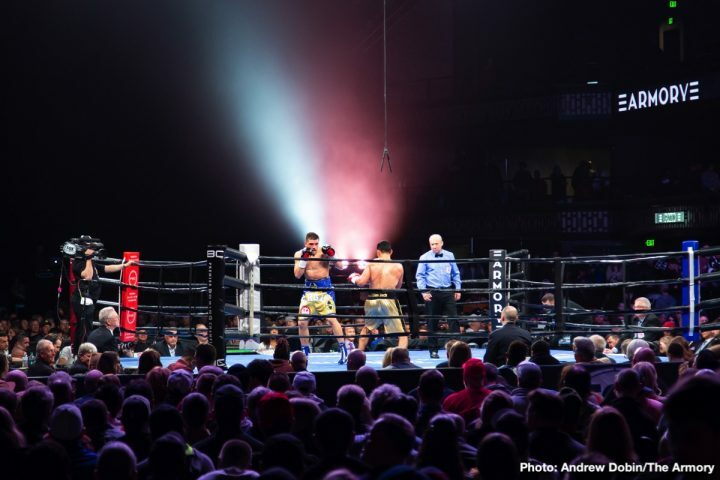 By Jim Dower: Sergiy Derevyanchenko (13-1, 10 KOs) defeated former WBA junior middleweight champion Jack Culcay (25-4, 13 KOs) by a 12 round unanimous decision in an IBF middleweight title eliminator on Saturday night on Premier Boxing Champions on FS1 & Fox Deportes at the Minneapolis Armory, in Minneapolis, Minnesota. The scores were 116-112, 116-112, and 115-113. Boxing News 24 scored it for Derevyanchenko by a 115-113 score. Derevyanchenko, 33, fought well though most of the fight, but the Germany based Culcay came on strong in the championship rounds to narrow the fight. Derevyanchenko looked tired, and he was hurt in the 11th round. Culcay had given away too many of the early rounds of the fight to Derevyanchenko, and that put him in position where he needed a knockdown or two to edge, but he couldn’t drop the 2008 Olympian from Ukraine. Derevyanchenko was the busier, more aggressive fighter in the fight, and he had the better power. Culcay could have pulled out the victory if he fought with more aggressive in the first three fourths of the fight. Culcay, 33, was too passive during major portions of the fight, and he let Derevyanchenko build up a big lead on him. Derevyanchenko was able to cruise in the second half of the contest to get the win. That was the difference in the fight. It was a good performance by Derevyanchenko, but not to the extent that he’ll do well against Saul Canelo Alvarez or Gennady Golovkin. The victory for Derevyanchenko now locks him in as the IBF mandatory to IBF middleweight champion Daniel Jacobs. Derevyanchenko could become the mandatory to Saul Canelo Alvarez if he beats Jacobs in their fight next month on May 4 in Las Vegas, Nevada. That fight will be shown on DAZN. In other results on the card, junior middleweight Ve Shawn Owens (10-2, 9 KOs) defeated Alexis Gaytan (5-3, 2 KOs) by an eight round split decision. The scores were 77-74, 76-75 for Owens, and 76-75 for Gayton. Owens was knocked down in the third round from a right hand to the head. Lightweight Chris Colbert (11-0, 4 KOs) defeated Mario Briones (29-9-2, 21 KOs) by a second round knockout. The fight was stopped by the referee at 1:59 of round two. Colbert knocked Briones down with a nice right to the head. After he got back up, Colbert finished him off with a flurry of punches. Undefeated super middleweight prospect Money Powell IV (10-0, 6 KOs) defeated Christian Aguirre (8-5, 4 KOs) by a sixth round knockout. Powell knocked Aguirre down in the sixth, and the referee then stopped it. Welterweight Jose Miguel Borrego (15-2, 13 KOs) defeated Hector Ambriz (12-10-2, 6 KOs) by a 10 round unanimous decision.